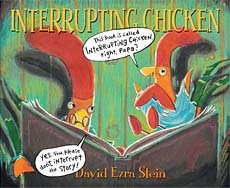 Interrupting Chicken is such a cute book! In the story, it's bedtime, and rooster papa is trying to read fairy tales to his daughter, but the sweet little chicken can't stop interrupting him to warn the characters of impending danger! Finally, rooster papa suggests she make up a story to tell him instead, and what she creates is an adorable childlike tale of a little chicken putting her rooster papa to bed. 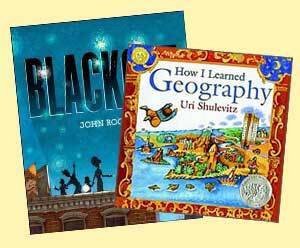 School Library Journal rightly said this is "one of the rare titles that will entertain both parent and child." So true! And, we've successfully used this book to talk about interrupting. Little chicken is adorable, true, but also clearly so disruptive -- and kids get that! Stein used watercolors, crayons, and ink to create the adorable, vivid illustration in this book. He also uses distinctly different looks to help distinguish the scenes in Papa Rooster's storybooks from the scenes in the main story. Very well done! Here are two sample spreads from inside Interrupting Chicken. These spreads occur at the beginning of the book, just as Rooster Papa is putting little chicken down to bed. Candlewick Press's (publisher of this book) has created a fun activity kit to go with this book. To access it, click here, then click on "Read to Us! StoryHour -- Activity Kit."